A touch menu is an on-screen overlay of game actions, displayed as a grid of choices selectable with a controller. These are very similar to Radial Menus, except that instead of aiming a virtual pointer to select an action, the player must touch a specific location on the input device. You can use these to e.g. switch weapons in a first-person shooter, toggle hotkeys in a real-time-strategy game or MMO, or any other use you can think of. Touch menus can be configured in many different ways in both behavior and appearance, and can be adorned with custom labels and icons (provided by either Valve, the developer, or the player). Touch menus are available in both native and legacy mode, but can only be driven by a trackpad. 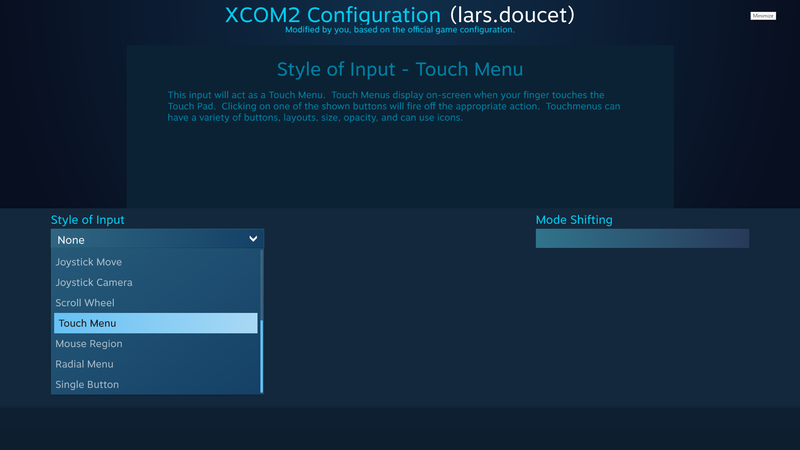 To create a touch menu, select a trackpad in your game's configuration, and select "Touch Menu" as the input style. This works in the exact same way as it does for Radial Menus. How many buttons will appear in your touch menu grid. Choices are 2, 4, 7, 9, 12, 13, or 16. Any buttons you leave unbound will simply appear blank, so if you have, say, 14 actions to bind, you should pick "16" and leave two blank. Each "Menu Button X" option can have an action (and/or legacy key binding) assigned to it. 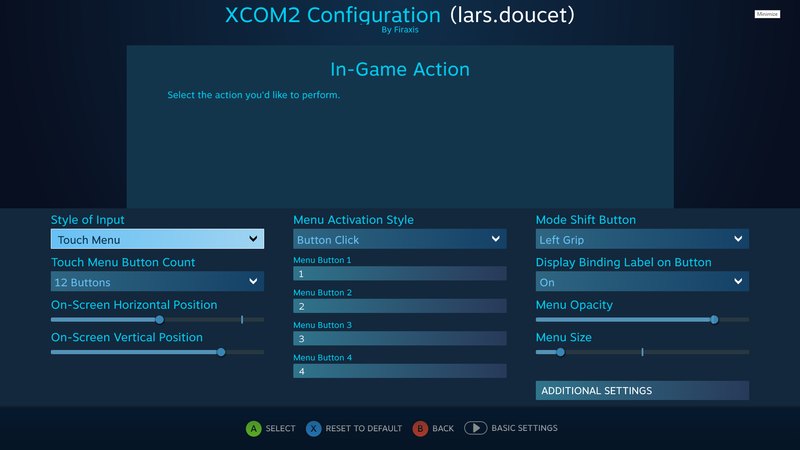 The basic configuration screen has four menu buttons, but you can assign up to sixteen (select "Additional Settings" for bindings for menu buttons 6-16). You can assign icons to each touch menu button, either picking from Valve's default icons, or provide your own. The method for doing this is identical to the one described in the Radial Menus document. Touch menus and radial menus draw from the exact same source files.